Scarpa's Charmoz GTX is a light Alpine/Mountaineering boot in the same class as the very popular La Sportiva Trango S EVO. On my scale the two boots are almost identical. The Charmoz weighs three pounds, five ounces per pair (size 42.5), exactly 0.5 ounces lighter than the Trango S. Both boots are lightly insulated, waterproof via Gore-tex XCR inserts, and rugged and highly water-resistant on the exterior. Both boots are compatible with semi-automatic or 'newmatic' crampons (strap-on front, snap-on binding on the rear), and feature an aggressive rubber sole for climbing traction. The Scarpa and the Sportiva are similar enough that it's probably fair to recommend getting whichever one happens to fit your feet better. That said, there are a few differences that emerge between the two boots after you get to know them a bit. Maybe the easiest way to distinguish the two boots is to say that, in my subjective opinion, the La Sportiva tilts more toward a summer boot, while the Scarpa tilts more toward winter. I thought the Scarpa was clearly better than the Sportiva when using crampons. The Charmoz has a really stiff, solid ankle, creating a stable platform that is reminiscent, when climbing, of a hard plastic boot. It was easy to flat-foot my way up an icy hill. My ankles never rolled, and my calves never got tired when I switched to front-point technique—nice. This stands in noticeable contrast to the Trango S, which I did find a little soft when climbing in crampons. The Scarpa Chamoz's stiffness, however, does come back to bite you (at least somewhat) when you get off snow and back on trail. Here, I think the Sportiva Trango proves to be the more comfortable walker, with a slightly more natural stride. I emphasize the 'slightly': both models are mountaineering boots, with 3/4" shanks and a great deal of stiffness in the soles. Neither boot makes for a comfortable, natural stride on approach compared to a soft hiking boot or God forbid a decent trail runner. 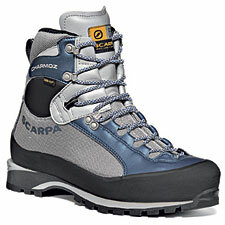 As for fit, the Scarpa is roomier overall, with more length and thus more comfort for your big toe. Oddly, I found the toebox problematic for my smaller toes (2, 3, 4, & 5), which pressed uncomfortably against the side of the boot during a marathon descent of the Mount Whitney Trail in the dark. Switching back to back, it seems as if my Trango S's are just as small or smaller in the toe, yet the pressure doesn't bother me as much. Something about the Scarpa's sidewall angle/hardness catches my pinkie toenail in just the wrong way. On the subject of fit, the Charmoz has a very clever instep clamp that will lock down the front of the laces, allowing you to customize the boot's cuff and midfoot tightness independently. This turns out to be a terrific idea, of huge use in the field when it comes to setting tension for the descent. Overall, I find myself unable to declare a clear winner when choosing between the two boots. As noted, they are both similar, and fit will likely ultimately dictate which choice is best for you. For me, I do tilt toward the Scarpa for its snow climbing ability. But then again, the Trango S sounds appealing for those punishing descents. If you're considering either boot, I will say you're choosing between two outstanding options. So let's call it a draw—happily so.